I know you come here for all sorts of random thoughts and rocking recipes, but starting today I am going to shift gears for a bit. The occasion? 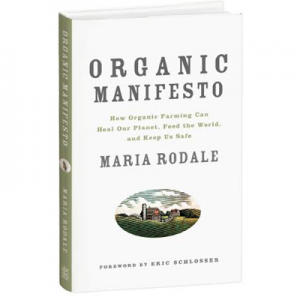 The impending launch of my new book, Organic Manifesto: How Organic Farming Can Heal the Planet, Feed the World, and Keep Us Safe, which comes out on March 16, 2010. I now have the fresh, newly printed (just born) copy of my book in my winter-chapped hands, and I am so excited for people to start reading it. Why? I think it’s a game changer for the whole conversation about food, health, the environment, and what we all can do about it. But first, I would like to share the WORLD PREMIERE of my video! I made a shorter copy for Amazon.com, but this is my favorite version, with music from one of my favorite bands, Plants and Animals. They gave me permission to use the song “Faerie’s Dance” for my video, and I am so grateful to them. To see my Organic Manifesto video now, click here. Eventually, I will get back to recipes and other topics. But right now, there is two feet of snow on the ground and my freezer’s contents are starting to dwindle, and there’s not much fresh produce in sight, so I’m kind of depressed about food right now, anyway. I am, however, incredibly excited about the possibilities of improving our health and the planet’s health through what I share in my new book. I hope you’ll help me get the word out. 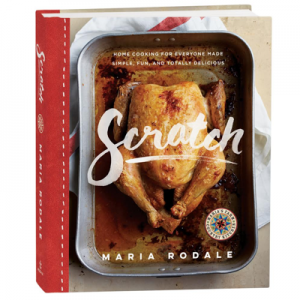 Maybe even preorder it from your favorite bookseller or online store. Or at least watch my video! 8 Responses to It’s Organic Manifesto Month! Keep us updated on any good restaurants along the way. I get out to the West Coast on occasion, and am always interested in good whole foods/ organic foods restaurants. Good luck and “knock ’em dead” Maria. I’ll do both, get the word out and purchase the book, how’s that for support. I’m going to watch the video now. Oh, do keep us up-to-date on your journey. I’ve read it! It’s a very shocking and amazing book. Best of luck, I know you’ll do great! Yes, we care. Thank you for saying what so clearly needs to be said. Glad you are a strong woman. Lead on. Just read your back page from Organic Gardening, and I almost yelled out loud, “Yes!” Instead of arguing about whether or not global warming is happening (among other things), how about we all yell, “Isn’t the real issue about who we are and what we do?” Are we greedy pigs who are willing to make the world ugly and stinky for our trivial wants? Do we care about “the health and safety of our children, our families, and the future viability of life”, or are we just going to go on and on making the world (preferably someone else’s patch of it) uglier and uglier?